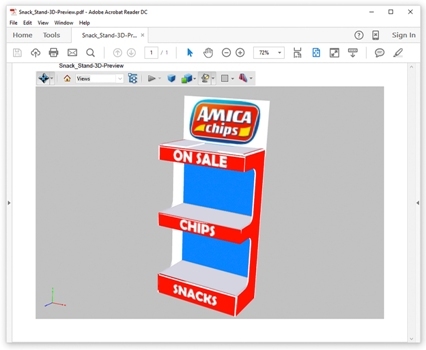 Powerful new three-dimensional design software for easy POP-display and box construction released. Compatible with all existing wide-format RIP software that drives flatbed printers and cutters, DisplayGenie also features a simple, yet complete toolset to enable easier display and box structure design A new point-of-purchase (POP) display and box design software has just been launched by SA International (SAi), a leading provider of software solutions for the professional sign making, wide-format digital printing and CAD/CAM for CNC machining industries. SAi DisplayGenie has been introduced for print businesses which are looking to extend their application offerings. Powered by the company’s Flexi software, SAi DisplayGenie has been developed to eliminate multiple steps in order to improve job creation efficiencies and simplify the structural design of folding carton, corrugated cardboard and sandwich material POP and free-standing display units, as well as packaging. "For a fraction of the price of high-end packages that are typically tied to specific manufacturer's hardware, SAi DisplayGenie enables large format print providers to quickly and easily get started with POP-display and box creation. By expanding their applications offering, print businesses can increase revenues and sharpen their competitive edge - all while enjoying enhanced production operations thanks to a simplified and expedited job design process." SAi DisplayGenie is compatible with all existing wide-format RIP software that drives flatbed printers and cutters and boasts a simple, yet complete toolset to enable easier display and box structure design. 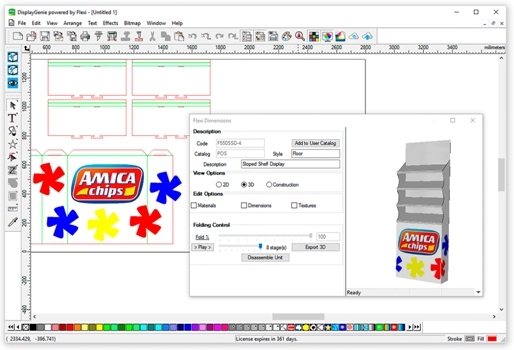 The new software has been designed to allow users to quickly choose and adapt existing templates from the wide-ranging and continually-expanding library of popular folding POP display, ECMA* and FEFCO* box templates. These can then be personalized with a selection of options including new artwork, designs, images and texts. One interesting feature is that when using DisplayGenie's intuitive interface, designers can enter new geometric values, from which the Flexi software then parametrically rebuilds designs in seconds. Another feature incorporated to further deliver cost- and time-saving benefits is provided by an integrated graphic and structural design with an animated 3D folding preview, helping maintain workflow efficiency by catching any mistakes before production. This is also aided by the ability to export rotational package display or box designs as 3D PDF files, for customer review or adjustment prior to production. Using the animated 3D folding preview, users can maintain workflow efficiency by catching any mistakes before productionAs a result, SAi DisplayGenie can overcome the troublesome pain-points faced by designers when creating such pieces in their existing third-part software. Typically difficult to visualize in 3D, achieving accurate design using Adobe Illustrator or Corel is often time-consuming and invariably relies on trial and error during production which is down to the difficulty in properly accounting for folding material thickness and folding behaviour. A business that already operates a flatbed printer, but might also be looking to install a flatbed cutter is the sector SAi expects DisplayGenie to particularly appeal to. Existing users of Flexi will be well acquainted with the familiar interface and will also be able to use the package on any number of existing licenses. * ECMA is the European Carton Makers Association; FEFCO is the European Federation of Corrugated Board Manufacturers.